There is an exciting change happening in nephrology training. Across the country, nephrology programs are bringing point of care ultrasound into their curricula. Nephrologists and nephrology trainees are not only using point of care ultrasound for the assessment of kidneys and bladder but also for volume assessment. In this article, we describe how our nephrology division designed a hands-on point of care ultrasound course for nephrology fellows. We also describe some important anecdotes from our experience that highlight the utility of this novel tool. Neither survey differentiated between ultrasound performed as a formal study and those performed at the bedside. In the last few years, ultrasound machines have become more portable and more affordable. Availability is increased as many emergency departments and ICUs house their own ultrasound machines. Therefore, opportunity exists for nephrologists to use ultrasound at the point of care to determine kidney size, measure bladder volume, assess for hydronephrosis, and even to evaluate volume status. Thus, the future of ultrasound training in nephrology may be in teaching-focused exams to answer discrete clinical questions rather than teaching complete examinations of the retroperitoneum and bladder. A significant portion of the course focused on using lung ultrasound to assess volume status. Lung ultrasound has the potential to be a revolutionary, paradigm-shifting tool for leading-edge nephrologists (see sidebar). Over the last two decades, intensivist Daniel Lichtenstein has demonstrated that when an ultrasound beam hits the surface of a normal lung, it generates artifacts called an “A line.” When an ultrasound beam hits a lung filled with water, it generates a reverberation artifact that juts away like a bright white rocket. These lung rockets are called “B lines.”7 A lines and B lines are shown in Figure 1. Research has shown that B Lines correlate with gold standards of volume assessment. Figure 1. A lines (left image) are horizontal artifacts that appear parallel to the pleural line and indicate a normally aerated lung. 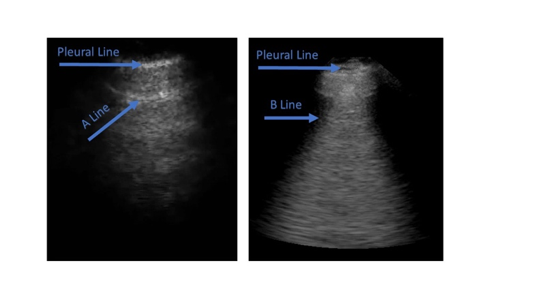 B lines (right image) are reverberation artifacts generated by water-thickened interlobular septa and represent pulmonary edema in the appropriate clinic setting. For nephrologists who are unfamiliar with lung ultrasound, there are three “need to know” points. First, B lines are a reliable method for determining volume status in dialysis patients. Second, a higher number of B lines in these patients correlates with greater mortality. Third, lung ultrasound is teachable and takes less than ten minutes to perform. Since our initial training course in 2015 and subsequent refresher course in 2016, our division has started to incorporate point of care ultrasound into clinical practice. In one illustrative example, we were faced with an elderly woman with chronic kidney disease who was admitted with an acute exacerbation of congestive heart failure. In the setting of diuresis, the patient’s creatinine rose and she developed acute kidney injury. Her volume status became difficult to discern by traditional physical examination and we were concerned that we had gone too far with the diuretics. Emboldened by our newly acquired skills, we performed a lung ultrasound. We found that the patient had a diffuse B line pattern consistent with pulmonary edema––not seen on chest x ray or appreciated on lung auscultation. Diuretics were increased and the patient’s creatinine improved back to baseline as her heart failure resolved. In another example, we used focused renal ultrasound to assess an elevated creatinine in a patient being considered for a left ventricular assist device (LVAD). In these patients, it is of paramount importance to identify whether the patient’s kidneys are intrinsically normal. At the time we evaluated this patient we did a point of care ultrasound examination. The kidneys were normal in size and had normal cortical thickness, there was no hydronephrosis, and the patient’s bladder was collapsed around the indwelling urethral catheter. This timely information, in conjunction with a bland urine sediment and a low urine sodium, enabled us to confidently identify the patient’s heart failure as the cause of his kidney injury. Ultimately the patient’s creatinine returned to normal two days after LVAD placement. The value of being able to rapidly discover urinary obstruction is immeasurable. A patient presented to our outpatient clinic for evaluation of an elevated creatinine. Based upon history, obstruction was suspected. A quick look at the patient’s bladder post void proved the case. The patient was referred to a same day urology appointment where an indwelling urethral catheter was placed. In this case, hospitalization was averted and a brewing renal injury was recognized early.